A big golden dude with a beer... every home should have one. I'm a writer, so creation is important to me, and it is a major part of my life. As a novelist, I create worlds and I create characters (and if I'm really lucky, sometimes I even create sales). As a blogger, I create long, rambling reviews. But as a gamer, I get to create... So many things. It is one of the reasons I love board games so much. 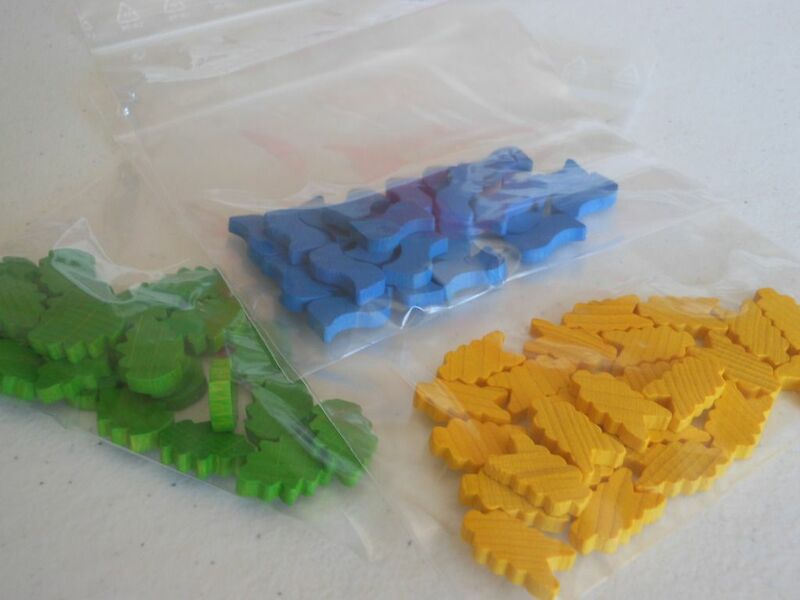 Each one is a tool kit, a set of building blocks; and each one lets you build something amazing within the constraints of the rules the designer has provided. A game like the sublime Winter Tales lets you create a story with your friends, weaving plot threads to seize objectives like spiders weaving a web to catch flies. A game like Snake Oil lets you create ingenious inventions, countless personas (as buyer or seller), and laughter. So much laughter. A game like Warhammer Quest lets you create a hero, and an epic tale for that hero to tell while quaffing ale at the tavern. A game like Battlelore lets you create an army to crush your foes. And a game like Machi Koro lets you create an economic engine that gradually expands and evolves until it spits out coins like an overly generous fruit machine. Yes, creation is a wonderful thing, and I am addicted to the feeling you get when you take disparate components and slot them together to make something that is so much more than the sum of its parts. It's why I love writing. It's why I love LEGO. It's why I love board games. And it's why I don't really enjoy Furstenfeld. Now, don't get me wrong. 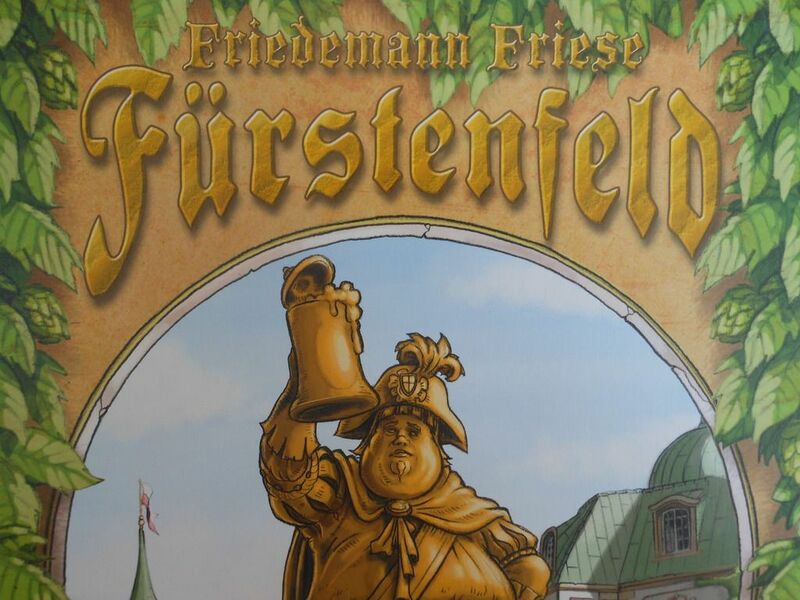 Furstenfeld is a bloody clever game, and it offers players the chance to create an economic engine as they struggle to harvest the ingredients the local brewers need to make their beer. But it also has an incredibly good mechanism that provides tension and interesting choices by demanding that, at some point, you have to tear down what you have built. But that's no reason why you shouldn't. Furstenfeld puts players in charge of their own "Furstenfeld," depicted by a board with six spaces on it. Three of the spaces generate resources (one for water, one for hops, and one for barley), and the other three are blank. Each turn, players draw cards representing new developments they can build onto the spaces on their Furstenfeld, assuming they have the money to do so. Basic options include fields that generate larger quantities of resources, but there are also banks that secure income every turn, town halls that allow you to hold cards back, laboratories that allow you to draw additional cards, and much more. Of course, you only have six spaces on your Furstenfeld board, so you can only have six developments at any one time. If you build over the top of an existing development, you lose that initial development and any benefits derived from it. That leads to some tricky choices. Sure, building a field that generates three water over the top of your space that only generates one water is an easy choice, but what about building a laboratory over your town hall? One lets you sift through your hand of cards quicker, so you can find the developments you need to advance your strategy, but the other lets you hold on to cards you would otherwise have to discard, so you can keep them until you can afford to pay for them. Which development fits into your strategy? What kind of Furstenfeld do you want to create? To be honest, there is nothing particularly new here; but it is all very slick. 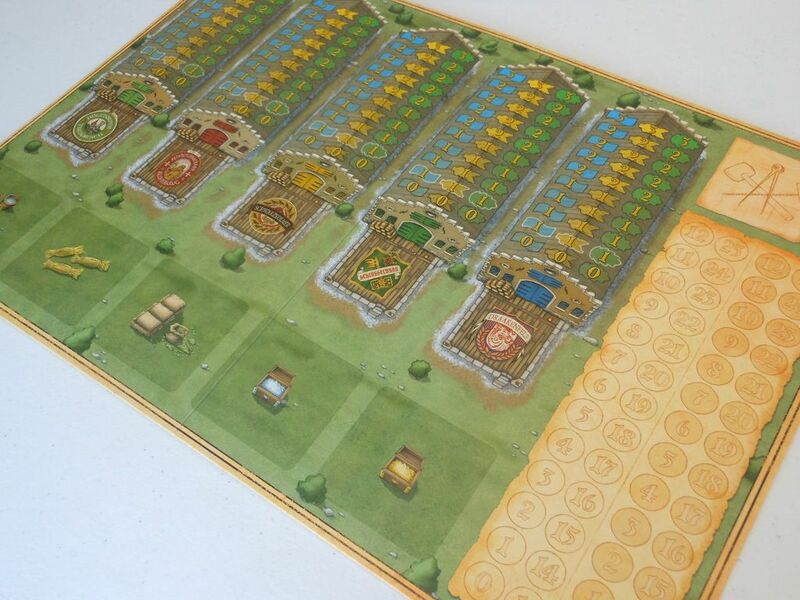 Each turn, you draw cards, then you harvest your goods, and then you sell them to make the money to build the developments that will make your next turn more efficient. It's a tried and tested idea that has appeared in countless games. 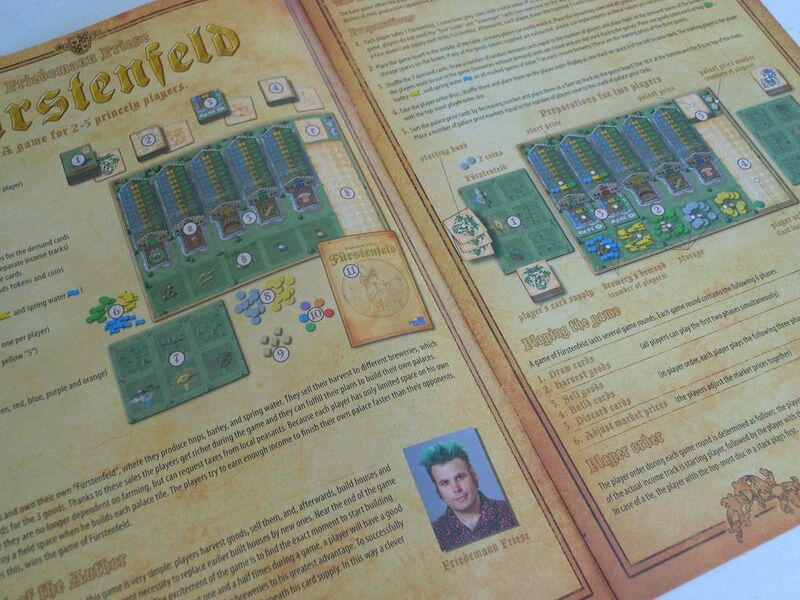 However, there are two wrinkles in the rules for Furstenfeld that give players something extra to think about. First of all, the market for the resources is variable. There are only a few breweries, and they only need a certain amount of each type of resource. When resources are plentiful, the value drops, until breweries start refusing to buy them completely. When resources are scarce, the price starts to climb, and there is a chance to make some big money. I'm not sure five rival breweries would set up in a row like this. As a result of the fluctuating market, players jostle to be the first to sell their goods, in an attempt to get the best price while saturating the market so other players are left with resources they are unable to sell. This is one of only two ways in which you can mess with your opponents, but it is integral to any strategy. The market system is all very streamlined, and works nicely, and as earning lots of money in one round means you are forced to act later in the turn order in the following round, it is difficult for one player to steam too far ahead. Psst... Hey Man, wanna buy some hops and barley? 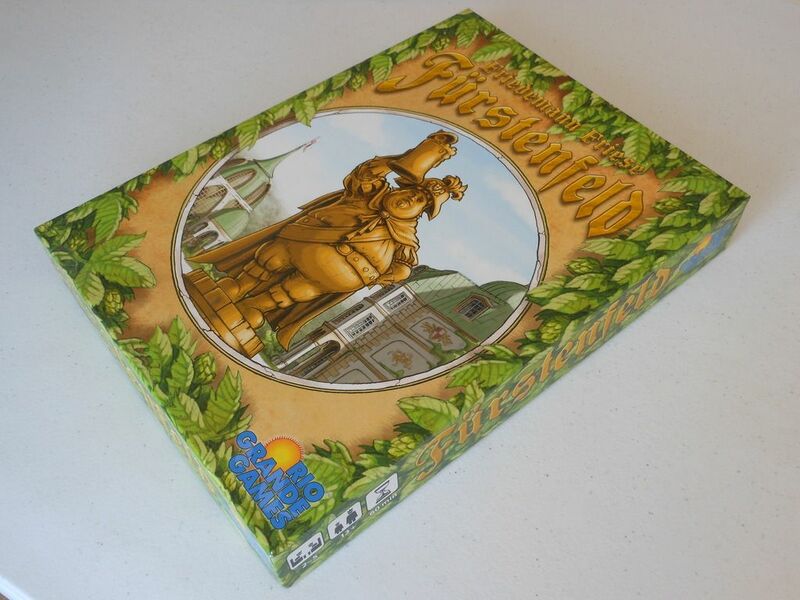 The second wrinkle in the rules is the big issue I have with the game: The reason every player is developing a Furstenfeld is because they want to build a palace. You know, so they can show off to the neighbours. Six of the development cards represent aspects of the palace. They are expensive, they keep getting more expensive as players build them (which is the second way you can screw with your opponents), and they don't actually do anything. They do not generate resources, and they do not grant any special bonuses. They just sit there like a heavy-handed social comment, filling up a space in your Furstenfeld. A space that used to have something productive in it. And you need to build all six palace cards to win, stealing victory by choking the life out of the economic engine you have built over the course of the game. I enjoy creating a little system of developments that link together to generate wealth and resources. I like watching my little Furstenfeld bloom, and I like trading in my chunky wooden money tokens to build a marketplace, or a crane, or a warehouse. No paper money... There was much rejoicing. But in every game, you eventually reach a point where you have to take one of your productive spaces and clag it up with a palace card. Now you've got a spanner in the works, and your super slick engine starts to sputter. This isn't like culling cards from your deck in Thunderstone: Advance to make your deck leaner and more efficient. Here, you are purposefully making your engine inefficient, and you have to balance which spaces you keep active, and which ones you lose forever. And I don't bloody like it. Towards the end of the game, you are land rich and stoney broke, desperately searching down the back of the sofa for the coins to build your last palace. You don't get to win this game in a blaze of glory, you just limp over the finishing line. You win by burying the wizened, useless corpse of your economic engine beneath an opulent palace-shaped tombstone. It just isn't fun anymore. I don't like creating things just so I can tear them down again. Things are a bit better in the advanced game rules. The palace cards are numbered and you have to build them in the correct spaces on your board, but you get some new cards that help you to rearrange your deck so you get the cards you want when you need them, and you get a tour bus that converts each palace into a fixed income every turn. 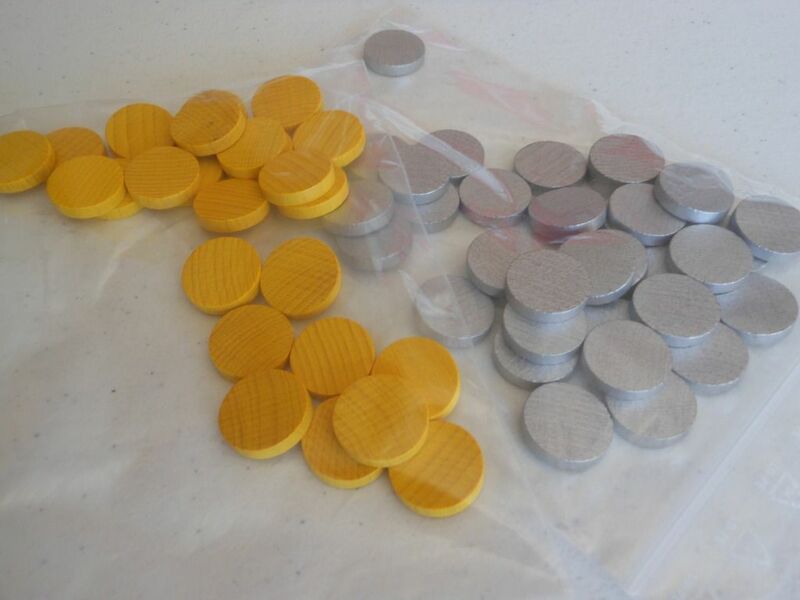 The problem there is that getting a fixed income means you don't get to be involved in the marketplace part of the game as much, so you lose that bit of player interaction and decision-making. And when it comes down to it, there is something about the latter part of the game that I just don't enjoy. You're paving paradise to put up a (very flashy) parking lot. Overall, I think this is a very clever game. It runs smoothly. Everything works (in fact, it works almost too mechanically, making it feel a bit dry). Figuring out the exact moment to start building palaces over your farmland is tricky, and the game has plenty of interesting choices. 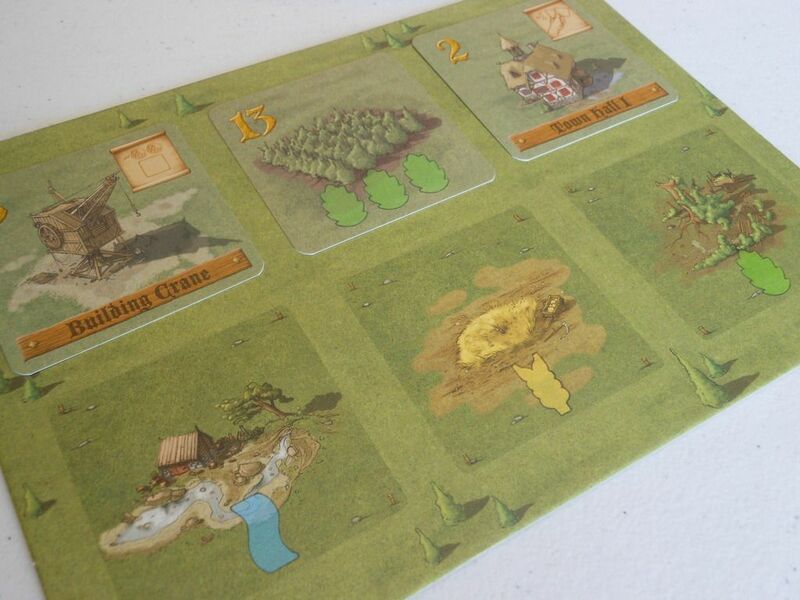 Plus, the rules fit on four pages, and that includes diagrams and the rules for the advanced game, so it is easy to learn and easy to teach. Check out Friese... He loves green. He has green hair. Crazy. I think a lot of people would like it. But it is a game of two halves. And unfortunately, I only enjoy one of them. I think I'll stick to building my palaces out of LEGO.